The Old Exchange Building was the state’s commercial, political and social epicenter during the Golden Age. Today it’s the most significant historic public building in Charleston, and a highly advertised family attraction. Although the building has many exhibits to enjoy, don’t expect “fireworks” or dramatic re-enactments on the guided Dungeon tour ($8 adults, $4 children 7-12). The museum is open daily 9AM to 5PM. You can park in the metered lot left of the building or the garage on Mid-Atlantic Wharf ($1 per hour, $10 per day). 1. The tour is geared toward kids and lasts about 30 minutes. Most of the time you listen to animated mannequins tell you stories about the burgeoning British rule, the capture of famous Caribbean pirates and the Patriots uprising. My 5 years old really enjoyed it, she was intrigued about all the (fake) rats roaming around. 2. 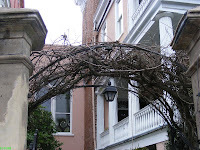 Mystery seekers should consider one of the city night tours, like the “Charleston Ghost and Dungeon Tour” offered by Bulldogs Tour ($18 adults, $10 children over 7. The website offers a $2 coupon). At night the Dungeon will make you shiver with its pitch dark pathways and eerie sounds…you may even catch an orb or two on your digital camera. 3. History buffs will appreciate the 2 stories filled with photos, original artifacts, exquisite furniture and stories from the Revolutionary and Civil War periods. I was humbled by the many pictures depicting the overwhelming destruction Charleston suffered during Civil War. Don't let the British get their hands on this! •	Stede Bonnet “the Gentleman Pirate” and crew are imprisoned prior to their hanging at the Battery Park. •	British tea is seized and stored in the Exchange cellars. •	South Carolina drafts its first constitution and declares independence from Great Britain. •	General William Moultrie hides 10,000 pounds of gunpowder in the cellar. • Colonel Isaac Hayne is imprisoned in the Exchange, and later executed by the British. 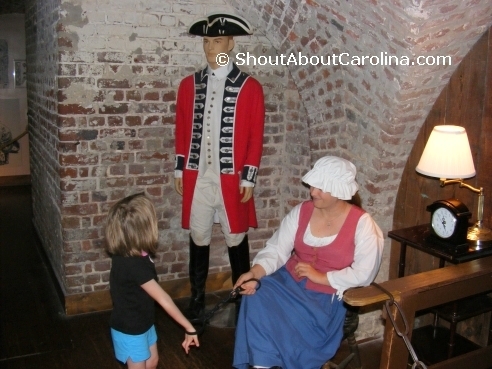 •	George Washington is entertained here several times during his Southern Tour. •	The Charleston Post Office moves into the Exchange. 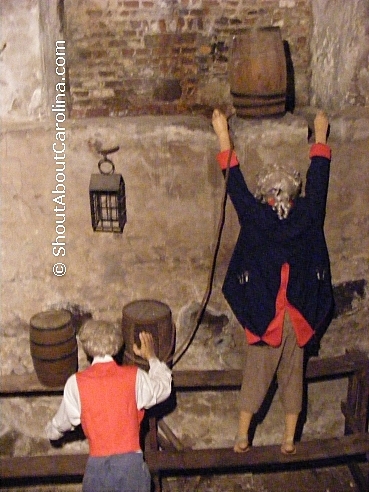 • The Half-Moon Battery, part of the original Charleston fortification is excavated beneath the cellar of the Exchange. 5. Children will enjoy the stories and graphical representations of the most famous Pirates who used to rule the Charleston Harbor and the Sea Islands: Stede Bonnet, Blackbeard, Calico Jack, Anne Bonny and Mary Read. Hey look at these old guns! If you decide to vacation at Folly Beach make sure to check out the beautiful Morris Island Lighthouse and to visit the country’s only Tea Plantation, that produces the flavorful, aromatic and truly eco-friendly American Classic Tea. 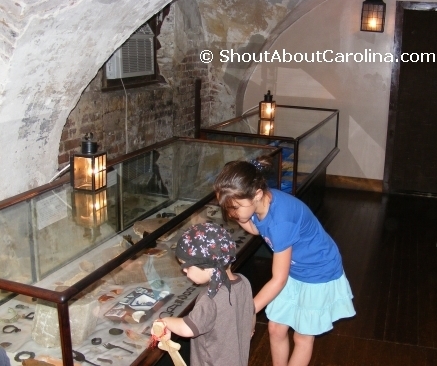 Did you know that more Revolutionary War battles were fought in South Carolina than in any other state? That’s right. The Palmetto State is home to over 200 battlegrounds. Every year history buffs, passionate tourists, military gamers, archaeologists, colonial photographers and 18th century enthusiasts gather in Camden, SC to celebrate our state’s role in the war. The Historic Camden War site is home to the nationally acclaimed Revolutionary War Field Days event. It’s a fantastic family outing filled with incredible military demonstrations, trade and crafts shows, live weapon firings, food competitions, dancing and more. Children get to experience the 18th century lifestyle through hands-on activities at the merchants’ camps. • Battle reenactment, daily at 1:30 PM. Beware it gets very loud. Here’s a video from the lively portray of the Stono Ferry battle near Charleston, among the few the Patriots lost to the Red Coats. It features SC Rangers and Militias and the Kershaw-Cornwallis Historic House, one of Lord Cornwallis headquarters during the war. The event usually runs on first weekend in November from 10AM to 5PM. Admission is adults $8, seniors and military $6, kids ages 6-12 is $3 and for under six is Free. Parking is free and plenty. No pets allowed on the premises. The Historic Camden Revolutionary War Site is located at South Broad Street in Camden, SC, about 1.4 miles on Hwy 521 North (exit 98 from I-20). • Say hello to the King at the Button Museum or admire the exquisite Topiary Garden. Both are located in Bishopville. • Relax at beautiful Lake Wateree, a fishermen delight, generous in crappie, bream, large mouth bass, catfish and striped bass. The H.L. 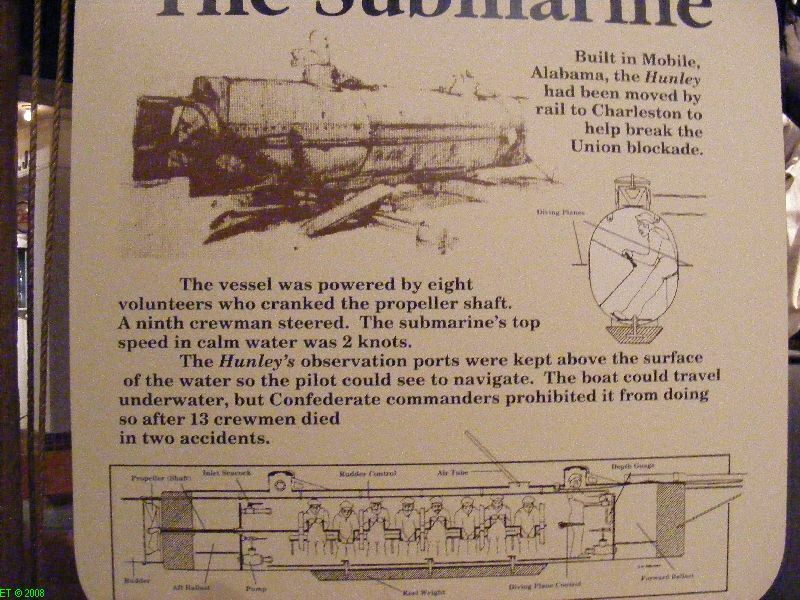 Hunley submarine drama continues to fascinate us centuries after its tragic Civil War combat disappearance. 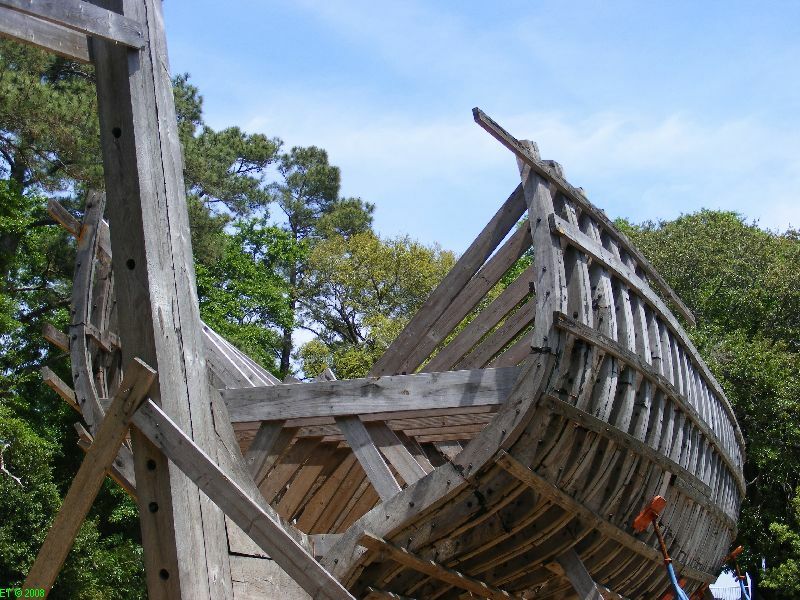 June 2011 update: Hunley comes to life! Almost 150 years after its sinking the beloved sub is finally sitting in an upright position. 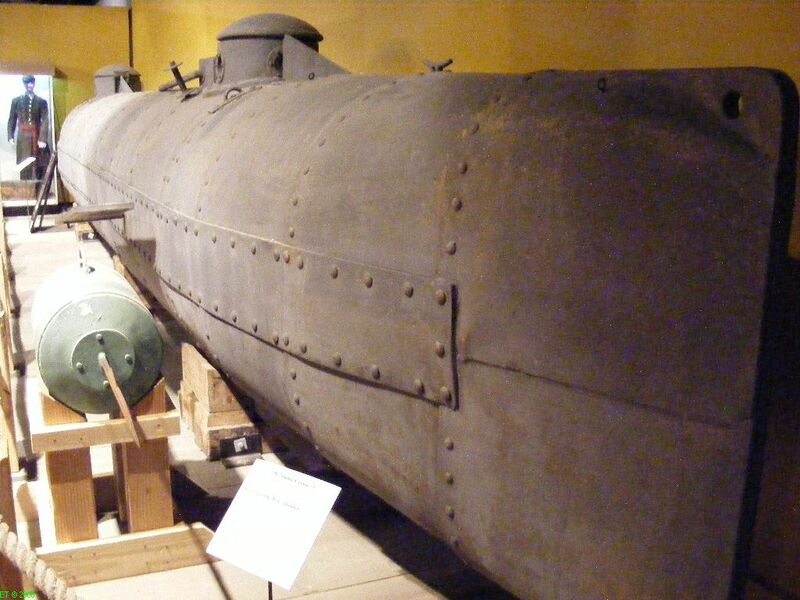 Since it was raised in 2000, the Hunley has been kept at a 45 degree angle for conservation purposes. After years of preparation and two days of small incremental rotations the sub is now sitting upright (video courtesy of The Post and Courier). According to Hunley archaeologist Maria Jacobsen “we are seeing some tantalizing clues on that side,”. However no breakthrough emmerged from a first look at the hidden hull. More info and new Hunley photos here. 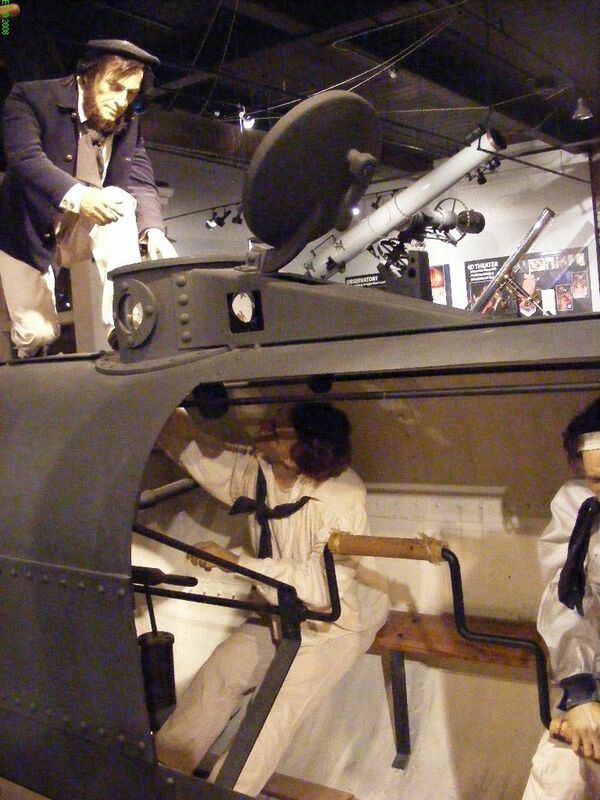 • World’s first submarine to successfully sink an enemy ship…only to perish hours later! • Found in 1995 it took 5 years to raise it safely for studying…“What we found was that these fellows were drowned, the bodies floated, they decomposed and slowly sank.” – Maria Jacobsen. • Despite being submerged under water for ~150 years it had an almost intact interior including the eight crewmen remains. More than 3,000 artifacts were collected, most valuable being people’s fingerprints and soft brain tissue still present inside the skulls! • 3-D laser mapping technologies were used for the first time in an archaeological project to reconstruct the interior at the time of the sinking. •	The crew sat the sub down on the ocean floor waiting for a favorable tide and ran out of air. •	The explosion from the charge carried on Housatonic also damaged the sub, flooding and settling the Hunley to the bottom. •	The Canandaigua, another Union war ship that came to aid Housatonic, swamped the Hunley because its hatches were open to allow fresh air into the hull. For one, take the pumps apart to figure out what was going on in the submarine. Scientists have already tried peeking with microscopic video cameras, but both pumps are filled with mud. Some day, with the help of better technology, put the crewmen fingerprints to use. “What we can do with them we don’t know” said Paul Mardikian, senior conservator at the Hunley project. Meanwhile you can visit this fascinating submarine at the Warren Lasch Conservation Center at 1250 Supply Street (on the old Charleston Navy Base) in North Charleston. Tours are offered Saturday from 10 AM – 5 PM and Sunday Noon – 5 PM. Tickets are $12, seniors, military and members pay $10, and kids under 5 get in for FREE. Check the website for details and live Hunley photos. You can also “play around” at its full size replica on display at the SC State Museum downtown Columbia. Admission to the museum is only $7. In 2010, I finally got to visit the Hunley. Here are the pictures and the stories of the most amazing artifacts discovered inside the submarine. Help solve the H.L. Hunley submarine mystery! There are two spirits haunting this intimate yet mysterious hotel. The Gentleman Ghost, sometimes referred to as the Gentleman Caller, usually visits room 10. “Well-dressed and groomed…he likes to lie down beside female guests. He never disturbs them knowingly.” If you scream or cry he will exit quickly through the nearest wall. 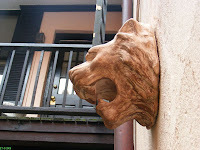 Check out this spooky lion-figure on the wall outside room 10, it’s just asking for specter trouble. A lady recalls her experience “…I was restless and couldn’t fall asleep…I noticed a wispy gray apparition to be floating through the close door, and through the air, entering the room…he lay down beside me on the bed. He placed his right arm around my shoulders. I didn’t feel any pressure from his arm touching me…I wasn’t frightened because he didn’t seem threatening”. The Torso Ghost is not as docile; he hasn’t harmed anyone yet is a far scarier sight to see. Clothed in wool gray Confederate uniform, it is believed this is the ghost of a soldier who lost his limbs and head during an accidental munitions explosion. One of the less fortunate people to have seen the Headless Ghost remembers “…what I could see on my side…was this torso of a person from the waist to the neck…It was big, not necessarily tall but broad. A strong, barrel-chested man…I reached out and touched it – his overcoat was very coarse material like burlap…the breath changed into the guttural growl of an animal. He moaned, or uttered some angry sound that made it clear he didn’t want me to do what I was doing…I felt like he wanted to chase me out of there”. phantoms and many other specters haunting the ever mysterious South Carolina grab Terrance Zepke’s exhilarating book “Best Ghost Tales of South Carolina“. Take a virtual tour of Charleston’s mystery, murder and romance tales and other famous ghosts sightings. Eager for more Lowcountry folklore? Visit Huntington Beach State Park to learn about Brookgreen Plantation’s bloodstains of the dead and Atalaya Castle’s gold-watcher. Happy Ghost Hunting in Haunted South Carolina! Take a virtual tour of the South Carolina historic trail at the Charles Towne Landing park near downtown Charleston. 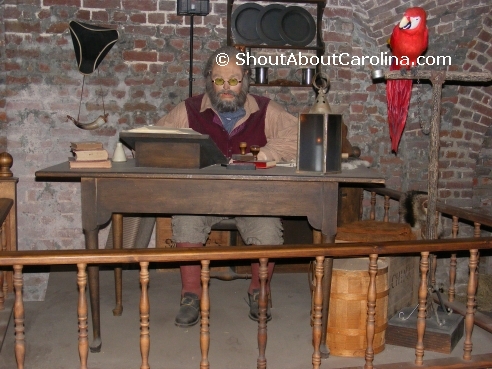 Step back in time at and enjoy the beautiful surroundings of Charles Towne Landing Historic Site! This is as good as it gets for a weekend family getaway! 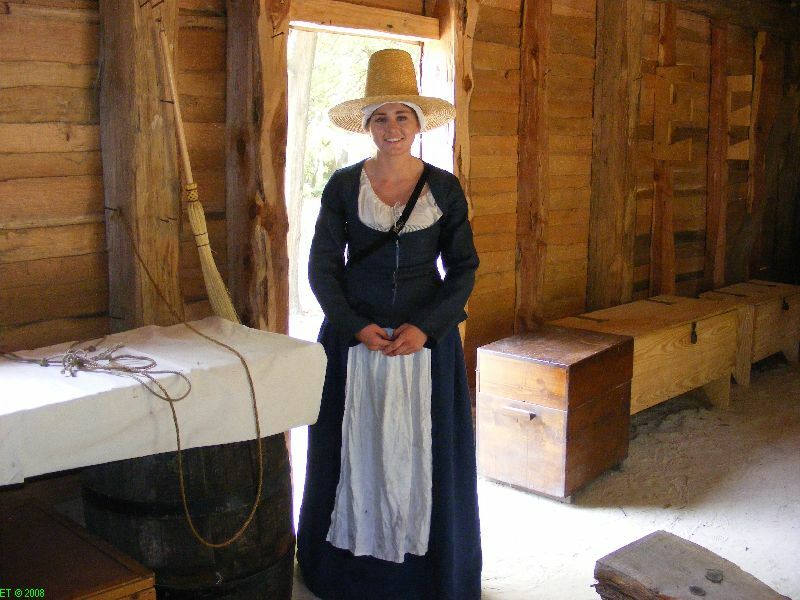 Step back in time at the Charles Towne Landing State Historic Site, the birth place of South Carolina. The park is just minutes driving from downtown Charleston and welcomes visitors to 80 acres of gardens, a self-guided historic walking trail through serene oak trees and Spanish moss avenues, beautiful marshes, ponds and creeks and a natural-habitat zoo featuring native wildlife at the time of settlement. You can bike, walk your dog, jog, and use the stroller; there are plenty of benches along the trail for you to rest and enjoy the view. 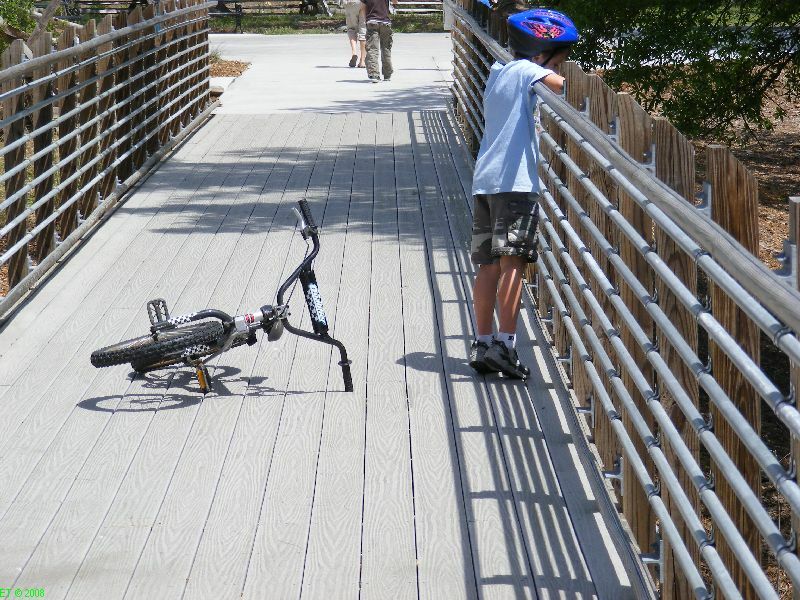 You will get great vistas photos of the marshes and Charleston’s Ravenel Bridge and Marina. Audio recordings for the self-guided walking trail are available for $5 at the Visitors Center. The trail is about 1.5 miles long at takes about 2 hours to complete. If you’re too tired to walk the park has a shuttle service for the Historic Trail. The park offers two restrooms, one at the Visitors Center and one on the trail; both have water fountains and vending machines. 1. The visitor center features twelve rooms of interactive exhibits telling the story of settlement and survival in the 17th century. 2. Before the African slave trade took off, the native Indian tribes fought each-other to capture prisoners and procure slaves for the settlers. We owe this beautiful park to Ferdinanda Legare Waring, the pioneering horticulturist who planted all the oak trees, lived and worked on the plantation and then sold it to the state for permanent preservation. The Horry ruins, a living testament to early Southern plantation homes; the house burned near the end of the Civil War. 6. 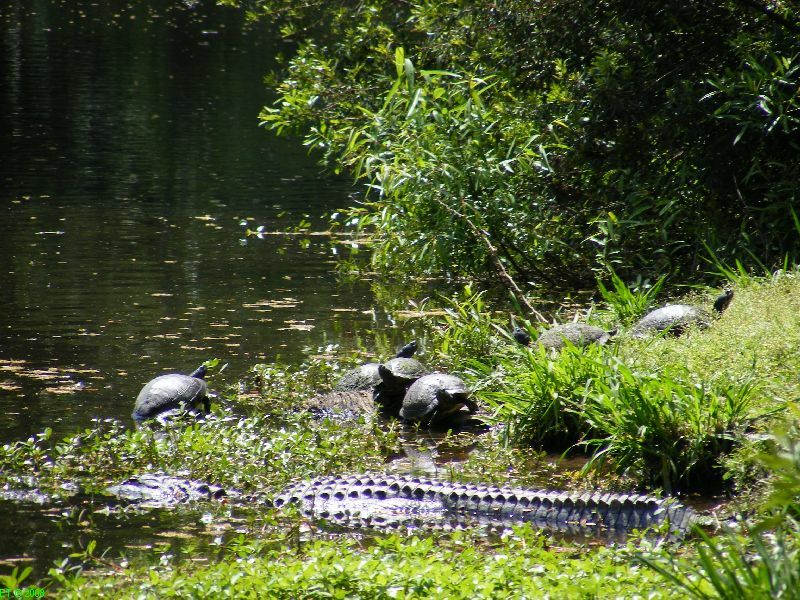 Alligators and turtles sun bathe along the park’s ponds, creeks and marsh beaches. A baby alligator welcomes visitors as you drive towards the visitor center. Although it doesn’t compare to Alligator Adventure the thrill of coming face to face with a gator in the wild is priceless. The Animal Forest zoo features bison, puma, bobcats, black bears, elk, otters and birds native to the time first settlers arrived more than 350 years ago. Unfortunately some species went extinct like the Passenger Pigeon, Carolina Parakeet and even the wild Puma. Take a virtual photo tour with this slideshow. 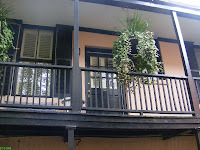 Charles Towne Landing Historic Site, 1500 Old Towne Rd, Charleston SC, (843) 852-4200. Directions: From I-26, take exit 216A onto Hwy 7 South. Bear left on Hwy 171 and follow signs. The park is open daily 9 AM to 5 PM except on Christmas Eve and Christmas Day. Admission Tickets: Adult $5, SC seniors $3.25, children ages 6 to 15 $3 and under 3 is free. Self-guided audio tour for the historic trail is an extra $5. 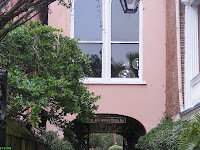 Happy family vacation in the Lowcountry a wonderful place filled with history, traditions and old-time stories! If you are visiting Columbia you can see a full size replica at the SC State Museum downtown. Of course, nothing beats the original, which can be admired in Charleston at the Warren Lasch Conservation Center (here is a Google Map with the location). Tours are offered Saturday from 10 AM – 5 PM and Sunday Noon – 5 PM. Tickets are $12, seniors, military and members pay $10, and kids under 5 get in for FREE. While in the area and you’re hungry for more military adventure go visit the USS Yorktown aircraft carrier. It has dozens of “little” war planes waiting for you to play with! -Reached the amazing speed of 2 knots in calm waters! -Its observation ports had to be kept above the surface for the pilot to navigate. 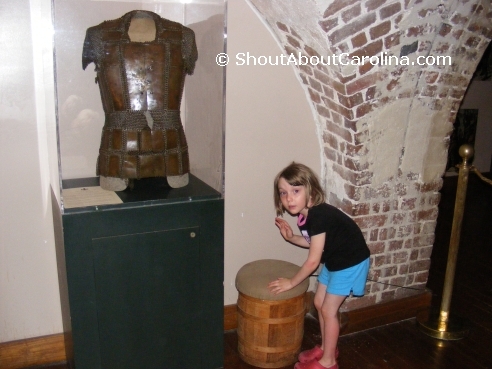 Let your children experience our country history in amazing South Carolina! Check out the latest clues uncovered at the Hunley recovery project. It’s about the sub bilge pumps! Out of “what to do this weekend” ideas? How about taking the kids to Jumps N More where they can safely burn energy bouncing and jumping and running around? It’s only $6.